Modern architectural projects make extensive use of seamless hot rolled, hollow sections. These structural elements as a result of their greater load bearing ability, lightness, availability in a wide range of wall thicknesses, and visual appeal, offer the architect unprecedented flexibility in design. The use of these tubes makes possible structures that are slender, light, aesthetically pleasing and yet very strong. If you are looking to create an iconic structure, UHS hollow sections offer numerous options. UHS hollow sections also find use in a variety of other structural applications such as the construction of off-shore derricks, agricultural machinery, crane booms, material handling systems, ships, and theme park rides. The special fine grain, high strength, quench and tempered UHS hollow sections described in this brochure are particularly well suited for such applications. Unlike welded hollow sections, which are made by bending a steel strip and welding it longitudinally, a seamless hollow section is made from solid steel billet by piercing and elongating it. The absence of a weld, and the associated discontinuity in metal properties, ensures complete structural integrity of these hollow sections. Furthermore, since these sections are hot rolled and not cold formed as in the case of welded tubes, the material properties are completely uniform along the cross section. All our tubes conform to European Standards (EN 10210) for hotfinished structural hollow sections. UHS hollow sections do not contain any weld and are hot formed. As a result, these have a fully normalized grain structure and uniform hardness along the cross section. Unlike their welded counterparts, these do not suffer from any weak spots, discontinuities in material properties, or residual stresses along the perimeter of the section. These sections are available in a wide range of steel grades including high strength grades that provide additional flexibility in design. These high strength grades include fine-grain steels and quench and tempered steels. Unlike welded structural hollows, which are restricted in wall thickness, UHS hollows are available in a very wide range of wall thicknesses - upto 40mm thick. This makes possible the design of structural elements with uniform external diameters under varying loads. For example, following this principle, the column diameter can be kept constant right through the height of the building. 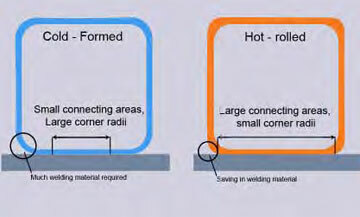 Hot rolled hollow sections have smaller corner radii, particularly when higher wall thickness tubes are involved. As a result, the welding material required reduces and the flat contact area increases. 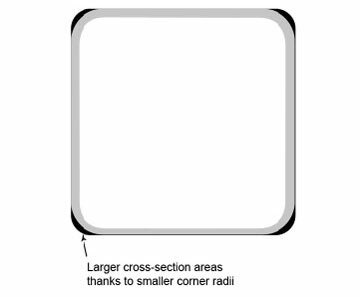 As a result of the reduced corner radii mentioned above, hot rolled hollow sections have a greater sectional moment and can,therefore, carry higher loads. Hot rolled seamless sections exhibit better buckling properties than their cold-formed welded counterparts. For this reason, Eurocode 3 norms allow higher buckling loads to be assigned to hot rolled sections. The empty space within the hollow section can be utilized effectively: UHS columns can be filled with concrete for added strength or with water for fire protection. Alternatively, this space can be used for conveying air-conditioning, electricity or water. 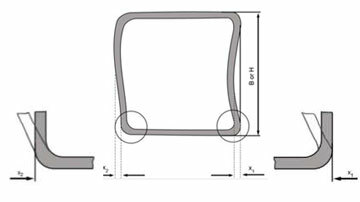 Weld volumes can be minimized by choosing smaller diameter sections with higher wall thicknesses. At ISMT, we believe the only way to guarantee quality is to stand responsible for the entire process. For this reason, the steel used for the manufacture of UHS hollow sections is produced in-house through the electric arc furnace route maintaining complete control of the entire production process. The raw material mix is chosen and prepared carefully to ensure the highest standards of cleanliness. All heats are fully killed, ladle refined and vacuum degassed before continuous casting into billets. These ultra-clean round steel billets form the starting point for the manufacture of UHS hollow sections. The round steel billets are ?rst heated to between 1,150 and 1,350º C in a rotary hearth furnace. After heating, these billets pass through a cross-roll piercing mill where a carefully positioned piercing point drives a hole through the solid billets to produce elongated rough hollow blooms. These hollow blooms are then rolled over a mandrel, either through a three roll Assel Mill or through a PQF Mill, and eventually through a stretch reducing mill, to produce accurately sized, hot rolled hollow sections. Stringent process control continues right through the manufacturing and testing process so that we are able to consistently deliver UHS hollow sections with the exact qualities that are required. = 16 > 16 = 40 Long. Transv. application in the construction of bridges, cranes, off-shore structures, buildings, ships and other structures where reduction of dead weight without any loss of load bearing capacity is critical. Typical characteristics of these tubes are high yield strengths and good toughness with the guarantee of chemistry that is suitable for welding. Tubes are produced as per following chemical analysis that guarantee the required mechanical properties which generally conform to EN 10297 specifi cation. Rp02 (MPa) min Rm (MPa) min A % Charpy KV long. Charpy KV Trasv. Tolerances will be as per EN 10297 specifications. 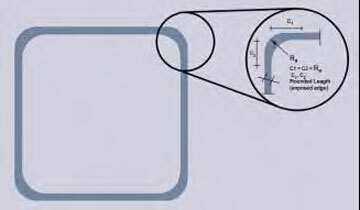 Permissible deviation in external dimensions D, B and H …………….±1% With a minimum of ±0.5mm. Tolerance on wall thickness T …. -10% for Seamless section, local deviation of -12.5% are permissible. 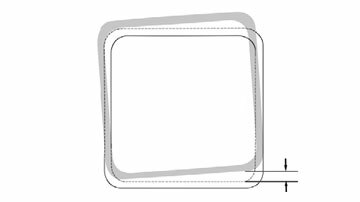 In the case of square USH sections, the wall thickness in the straight edge area must be checked the upper layer of the wall thickness is determined by the maximum weight. Permissible curvature of lateral surfaces concavity/convexity =1%. The Value of permissible concavity or convexity apply independent of the tolerances on External dimensions. Maximum mass tolerance per section = ±6%, ±8%. All the steel grades indicated in this brochure have been specially developed so that they have a low carbon equivalent and are easily weldable using traditional welding procedures (provided generally accepted technical rules are followed). For very thick sections, precautions should be taken to avoid cold cracking. In such cases, pre-heating prior to welding is advisable. Standard lengths supplied by ISMT are from 5 to 10 mtrs long. 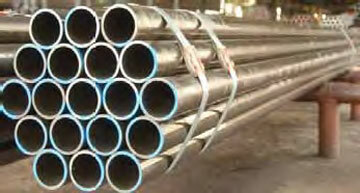 Tubes in exact length based on specific request can also be supplied. 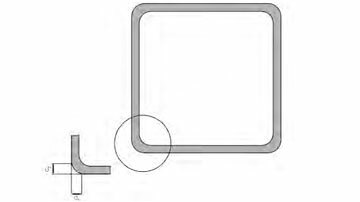 Tubes with square cut ends or bevelled ends can be supplied. Product details are available on request.